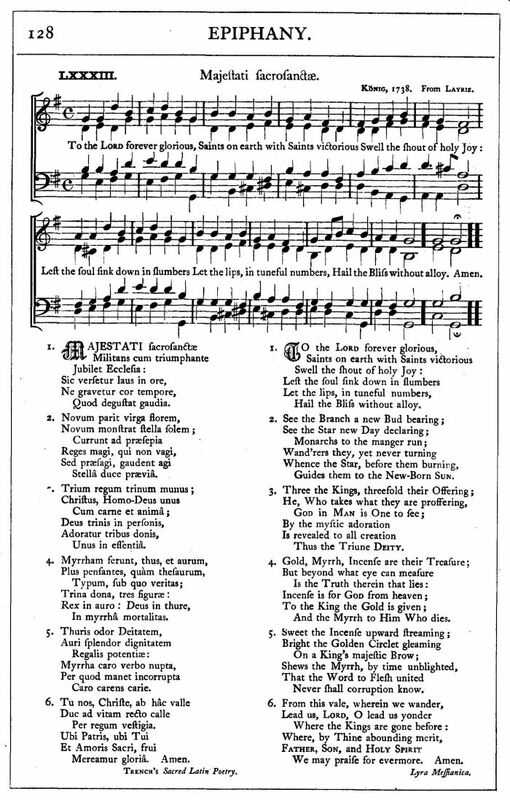 Music: König, 1738. From Layriz. Source: J. H. Hopkins, ed., Great Hymns of the Church Compiled by the Late Right Reverend John Freeman Young (New York: James Pott & Company, 1887), #83, p. 128. Hail the Bliss without alloy. Guides them to the New-Born Sun. And the Myrrh to Him Who dies. We may praise for evermore. Amen. Sheet Music from J. H. Hopkins, ed., Great Hymns of the Church Compiled by the Late Right Reverend John Freeman Young (New York: James Pott & Company, 1887), #83, p. 128.